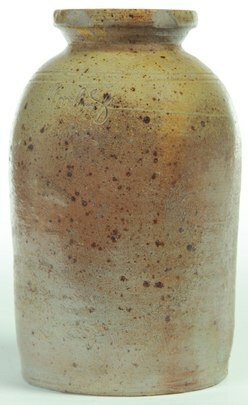 This stoneware crock jar is signed H. Morfoot and actually signed into the clay, the only other ones I have been able to find to compare to are Jacob Morfoot not signed but impressed stamped. Anyone have any knowledge of these? The center jar has your signature on it. The largest employers in Muskingum County, Ohio, are retail establishments, with manufacturing businesses a close second. The most important industry in the county during the second half of the nineteenth century was art pottery manufacturing. Samuel A. Weller became the most important manufacturer in 1890, when he began production in Zanesville. Most of his early products included simple items like flower pots, cuspidors, and tableware. By 1905, more than five hundred workers found employment in Weller's plant. These workers produced three boxcars full of pottery every day, making Weller the largest manufacturer of pottery in the world by the 1910s. Thank you for your response. The 1st pic of the 3 is the one I found too and the second pic is definately like mine in the writing except mine has an H in front of the Morfoot. Do you think mine could be dated in the late 1800's because of the piece being signed rather than stamped? There are many "stamped" pieces from various artists that seemed to work for the Ohio companies. I have to question the first initial on your piece, however. Noticing how large the M is in the last name, it seems like the letter may not be H. If you look closely at the example I provided and compare it to yours, I would say it does look like a J...just that yours was not fully impressed. Therefore, it seems that maybe his signature was a stamp. Regardless, it was all happening in the late 1800s to the early 1900s, so it is old.